This sweet rental is in the type of building that film location managers seek out to illustrate the quintessential San Francisco life; it screams "City by the Bay!" You and a bunch of friends, or your small family, could move into this three bedroom, one and a half bathroom Edwardian beauty for a mere $4,000 a month. And it's set right in Pacific Heights which is a very clean, safe neighborhood populated by tons of shops and delicious restaurants. Did you know the movie "Pacific Heights" was actually filmed in the Potrero Hill neighborhood of San Francisco? Yes, it was. With this lovely flat, you can be the stars of your own Pacific Heights movie. In this film, you get 1,200 square feet of comfort in a bright and quiet unit with high ceilings, hardwood floors, and plenty of light from large, double-bay windows. Do you like charm? Well this place certainly has it. The entire place is completely remodeled so you can have that Edwardian look without living in the Edwardian age. For example, there was no unit washer and dryer in Edwardian times. Nor was there a renovated granite kitchen with brand new appliances. Need I mention the locale is also close to the Presidio Park which is an awesome chunk of nature located close to the Marina. 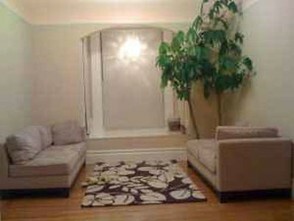 Click here to read more Sweet San Francisco Rentals.